Get it on Amazon by clicking this link! 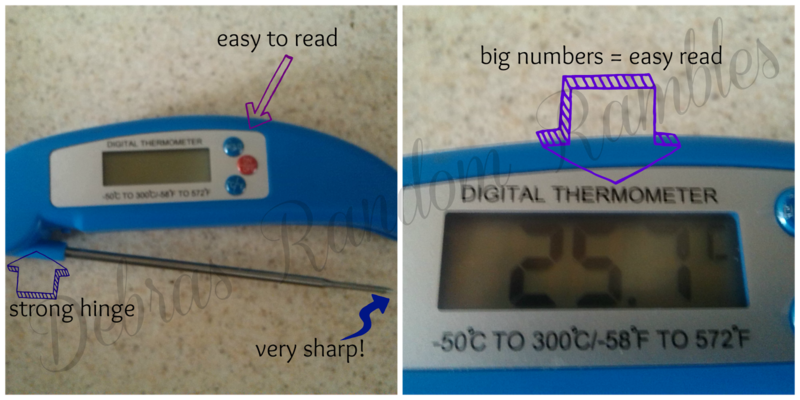 This Folding Waterproof Digital Thermometer Can Be used to measure temperatures deep inside a food's surface. It can be used for personal, professional, or commercial purposes. The thermometer is easy to use and features a measuring range of 14 to 230° F with an accuracy of 1°C and also offers an auto off function. The probe tip measures 0.137". Digital Meat thermometer features a long 7" Probe that makes it convenient and easy to use while cooking. I have used alot of meat thermometers in my life! When I was a teen I got massively sick after eating under cooked hamburg. Since then I have always used something to make sure my meat was cooked! Most other ones I have used the tip has worn down and become dull or has even broken off! Or I have not been able to read it because the dial was messed up after so many uses. I not only use it on meat but I also have been using it on the stove top cooking and candy making. I have finally found a thermometer that I like! I especially like the fact the numbers are big and easy to read instead of the dial type that you sometimes cant read!